Comedy Films are "make 'em laugh" films designed to elicit laughter from the audience. Comedies are light-hearted dramas, crafted to amuse, entertain, and provoke enjoyment. 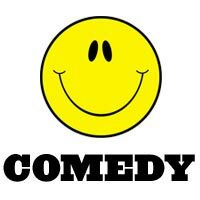 The comedy genre humorously exaggerates the situation, the language, action, and characters. Comedies observe the deficiencies, foibles, and frustrations of life, providing merriment and a momentary escape from day-to-day life. They usually have happy endings, although the humor may have a serious or pessimistic side. See this site's Funniest Film Moments and Scenes collection - illustrated. In mid-June 2000, the American Film Institute (AFI) selected America's 100 Funniest Movies. See 100 Funniest Films as presented by this site, as well as Premiere Magazine's 50 Greatest Comedies of All Time. See also AFI's 10 Top 10 - The Top 10 Romantic Comedy Films and 101 Funniest Screenplays of All-Time. Slapstick was predominant in the earliest silent films, since they didn't need sound to be effective, and they were popular with non-English speaking audiences in metropolitan areas. The term slapstick was taken from the wooden sticks that clowns slapped together to promote audience applause. This is primitive and universal comedy with broad, aggressive, physical, and visual action, including harmless or painless cruelty and violence, horseplay, and often vulgar sight gags (e.g., a custard pie in the face, collapsing houses, a fall in the ocean, a loss of trousers or skirts, runaway crashing cars, people chases, etc). Slapstick often required exquisite timing and well-honed performance skills. It was typical of the films of Laurel and Hardy, Abbott and Costello, W. C. Fields, The Three Stooges, the stunts of Harold Lloyd in Safety Last (1923), and Mack Sennett's silent era shorts (for example, the Keystone Kops). Slapstick evolved and was reborn in the screwball comedies of the 1930s and 1940s (see further below). More recent feature film examples include the comedic mad chase for treasure film by many top comedy stars in Stanley Kramer's It's a Mad, Mad, Mad, Mad World (1963), and French actor/director Jacques Tati's mostly dialogue-free Mr. Hulot's Holiday (1953, Fr. ), and Jim Carrey in Ace Ventura, Pet Detective (1993) and The Mask (1994). The Blake Edwards series of Pink Panther films with Peter Sellers as bumbling Inspector Clouseau (especially in the second film of the series, A Shot in the Dark (1964) with Herbert Lom as Clouseau's slow-burning boss and Burt Kwouk as his valet and martial arts judo-specialist) are also great examples. Cartoons are the quintessential form of slapstick, i.e., the Roadrunner and Wile E. Coyote, and others. This form of comedy was best exemplified by the expression-less face of stoic comic hero Buster Keaton. This was classically typified by the cruel verbal wit of W. C. Fields, the sexual innuendo of Mae West, or the verbal absurdity of dialogues in the Marx Brothers films, or later by the self-effacing, thoughtful humor of Woody Allen's literate comedies. Screwball comedies, a sub-genre of romantic comedy films, was predominant from the mid-1930s to the mid-1940s. The word 'screwball' denotes lunacy, craziness, eccentricity, ridiculousness, and erratic behavior. These films combine farce, slapstick, and the witty dialogue of more sophisticated films. In general, they are light-hearted, frothy, often sophisticated, romantic stories, commonly focusing on a battle of the sexes in which both co-protagonists try to outwit or outmaneuver each other. They usually include visual gags (with some slapstick), wacky characters, identity reversals (or cross-dressing), a fast-paced improbable plot, and rapid-fire, wise-cracking dialogue and one-liners reflecting sexual tensions and conflicts in the blossoming of a relationship (or the patching up of a marriage) for an attractive couple with on-going, antagonistic differences (such as in The Awful Truth (1937)). Some of the stars often present in screwball comedies included Katharine Hepburn, Barbara Stanwyck, Claudette Colbert, Jean Arthur, Irene Dunne, Myrna Loy, Ginger Rogers, Cary Grant, William Powell, and Carole Lombard. These are dark, sarcastic, humorous, or sardonic stories that help us examine otherwise ignored darker serious, pessimistic subjects such as war, death, or illness. Two of the greatest black comedies ever made include the following: Stanley Kubrick's Cold War classic satire from a script by co-writer Terry Southern, Dr. Strangelove or: How I Learned to Stop Worrying and Love the Bomb (1964) that spoofed the insanity of political and military institutions with Peter Sellers in a triple role (as a Nazi scientist, a British major, and the US President), and Robert Altman's M*A*S*H (1970), an irreverent, anti-war black comedy set during the Korean War. Another more recent classic black comedy was the Coen Brothers' violent and quirky story Fargo (1996) about a pregnant Midwestern police chief (Oscar-winning Frances McDormand) who solves a 'perfect crime' that went seriously wrong. Hal Ashby's eccentric cult film Harold and Maude (1972) was an oddball love story and dark comedy about a suicidal 19 year-old (Bud Cort) and a quirky, widowed octogenarian (Ruth Gordon), with a great soundtrack score populated with songs by Cat Stevens. (See examples of other feature films below for more.) John Huston's satirical black comedy Prizzi's Honor (1985) starred Jack Nicholson as dimwitted Mafia hit man Charley Partanna for the East Coast Prizzi family, who fell in love with West Coaster Irene Walker (Kathleen Turner) - another mob's hitwoman. The film included an Oscar-winning performance from Anjelica Huston as the vengeful granddaughter of Nicholson's Don. Tim Burton's dark and imaginative haunted house comedy Beetlejuice (1988) featured Michael Keaton as the title character in a dream house occupied by newlywed spirits Geena Davis and Alec Baldwin. The shocking but watchable first film of Peter Berg, Very Bad Things (1998) told the dark and humorous story of a 'bachelor' weekend in Las Vegas gone bad for five guys when their hired stripper/prostitute was accidentally killed. Classic screwball comedies and other classic comedies: such as Trouble in Paradise (1932), Twentieth Century (1934), My Man Godfrey (1936), His Girl Friday (1940), To Be or Not to Be (1942), The More the Merrier (1943), Arsenic and Old Lace (1944), Born Yesterday (1950), The Seven Year Itch (1955), Some Like It Hot (1959), etc. Other recent examples: What's New, Pussycat (1965), A Funny Thing Happened on the Way to the Forum (1966), Murder by Death (1976), Tootsie (1982), Planes, Trains and Automobiles (1987), Peter Bogdanovich's Noises Off... (1992), There's Something About Mary (1998), Waking Ned (1998), South Park: Bigger Longer & Uncut (1999), Anchorman: The Legend of Ron Burgundy (2004), The 40 Year Old Virgin (2005), The Simpsons Movie (2007), etc.